Scott Bader was awarded LM Wind Power’s Most Innovative Supplier Award. 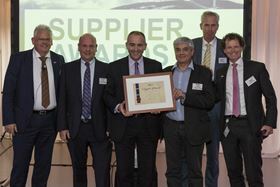 Scott Bader has been named ‘Most innovative supplier 2016’ for its new, ‘zero styrene’ spray gelcoat technology by LM Wind Power whose factories use Scott Bader gelcoat and structural adhesive in the production of FRP wind turbine blades. ‘We dedicate more than 10% of our global workforce to research and development (R & D), and see innovation and bringing new advanced technology products to market as a key corporate strength and competitive differentiator,’ said Malcolm Forsyth, director of global strategy. ‘A key sustainable development goal agreed by the council is to eliminate styrene from all LM Wind Power plants in a staged process over the coming years,’ said Marc van Heeringen, supply chain leader for chemicals at LM Wind Power. ‘Now that Scott Bader has successfully developed a new zero styrene gelcoat that also meets all quality criteria for our wind turbine blades, we are a big step closer to achieving this sustainability goal in all our FRP production facilities.’ Over the coming years, LM Wind Power plans to switch all gelcoated blade parts molded around the world to the zero styrene gelcoat. In 2012, Scott Bader launched its new low styrene content gelcoat Crystic Ecogel S1PA, and LM Wind Power became the first blade producer in the industry to use it in all of its manufacturing facilities, reducing shop floor styrene emissions by more than 50%. This story is reprinted from material from Scott Bader, with editorial changes made by Materials Today. The views expressed in this article do not necessarily represent those of Elsevier. Composite coating specialists Andercol and Scott Bader say that they have expanded their Novascott joint venture plant. Scott Bader plans to launch two new brands at JEC World 2018, taking place from 6-8 March 2018 in Paris, France.